We finally bit the bullet and nabbed our very own exclusive event space! We love it here—it’s like home (if, you know, we lived in a 2.5 story, 30,000 square foot, historic Tudor-Revival mansion). 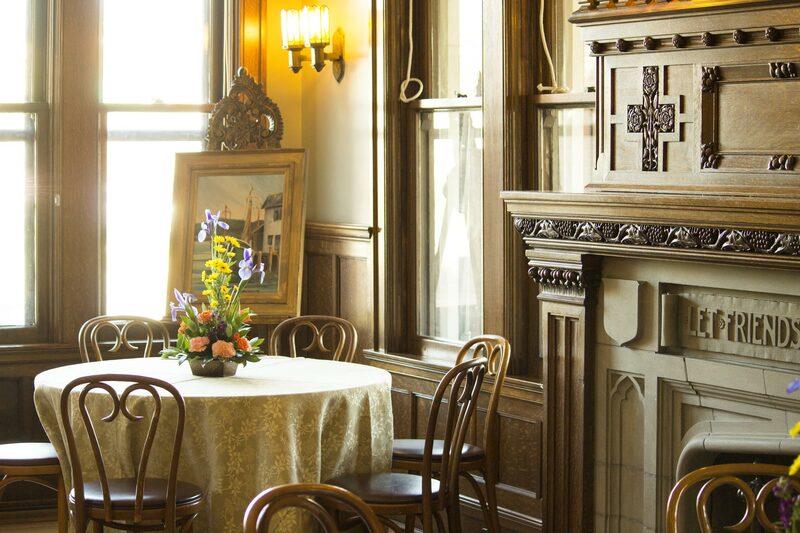 The Glossbrenner Mansion’s exquisite stone carvings, leaded and stained glass windows, hardwood floors, and original oak/mahogany/Circassian walnut paneling present the perfect setting for cocktail parties, rehearsal dinners, showers, brunches, teas, and smaller weddings. Oh, and the walls are just plastered with important, original Indiana artwork. Built in 1910, this stately home—located at 32nd and Meridian, in case you were wondering—was commissioned by Alfred M. Glossbrenner, who made his fortune in the publishing industry. In 1982, the mansion was officially listed on the National Register of Historic Places (so you know it’s important), and was gifted to Indiana Landmarks in 2010. They sold it to Broad Street Development in 2015, and now we get to live here! Pro tip: When you come for a visit, be sure to go on an English rose scavenger hunt. They’re hidden everywhere, guys—in the stained glass windows, on doorknobs, carved into the woodwork, in the stone walls outside…. Eager to learn more? Give us a call! We’ll chat your ear off about all the amenities this beautiful space has to offer. We might even give you a tour if you ask nicely.